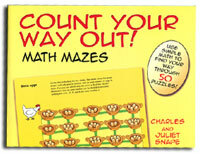 BOOKS: Count your way out! Many items sold on this site are VAT zero rated, however some do attract VAT, this is included in the price shown at the current rate (July 2011). Vat registration number 429 800 36. We endeavour to dispatch all orders within 24 hours. Please allow 2 to 3 days for delivery in the UK. A 'p+p' charge of £4.00 is added to all orders no matter how many items you order (orders for Buzz and Circa ONLY are post free in UK). Postage on this site is to UK only. 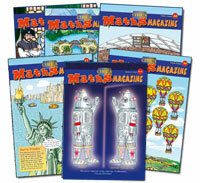 For shipping to the EC or worldwide please email: mathstore@circamaths.co.uk for a quote. 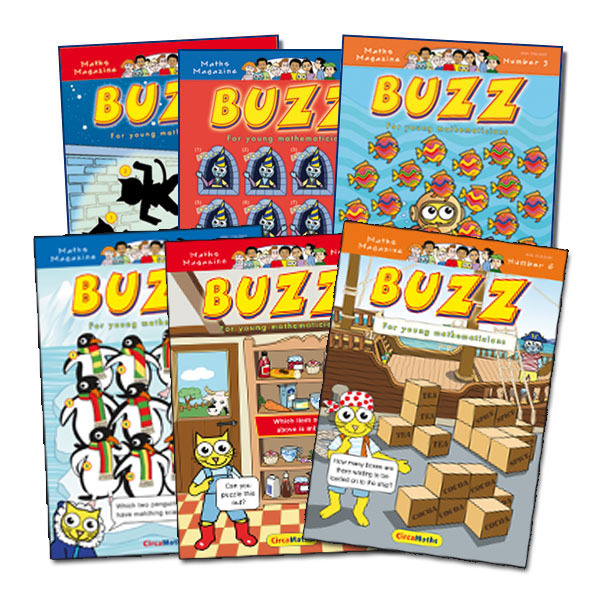 The new volume of BUZZ is Volume 6. 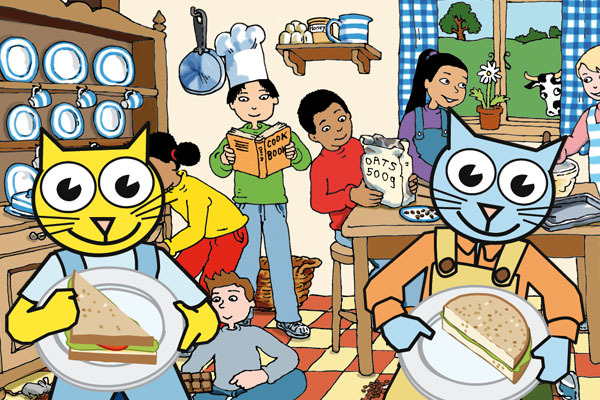 It consists of three issues: number 16 (Cooking numbers), number 17 (Opposites) and number 18 (Patterns). Each issue is posted to you on publication (November, March and June). Postage is included in the price of this item. Click here for more about BUZZ. 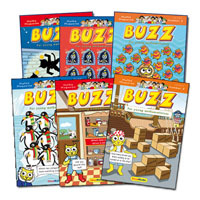 Each volume of BUZZ consists of three issues. Back issues are delivered in one pack. Postage is included in this item. Click here for more about BUZZ. The next volume of CIRCA is Volume 18. It consists of three issues: number 52 (Shape), number 53 (Number operations) and number 54 (Amazing maths). Each issue is posted to you on publication (November, March and June). Postage is included in the price of this item. Online solutions and teacher's notes. Click here for more about CIRCA. Use the pop-up menu to choose a volume. You can choose as many different volumes as you like by returning from the cart to this page. Each volume of CIRCA consists of three issues. Online solutions and teacher's notes. Back issues are delivered in one pack. Postage is included in this item. Click here for more about CIRCA. 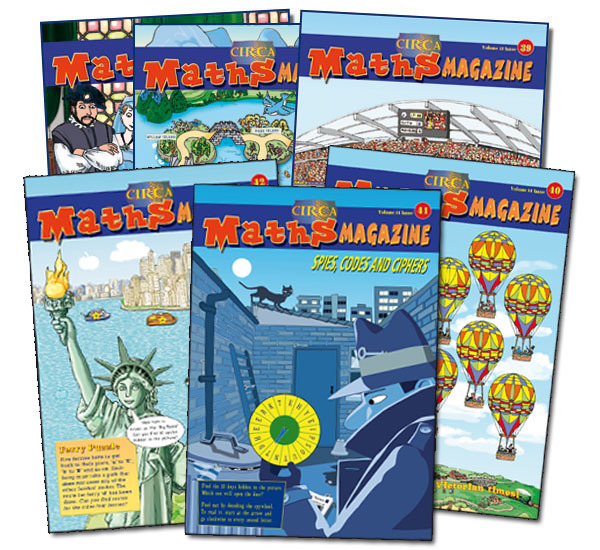 After many requests, this comprehensive compilation of past CIRCA issues covers five FRACTION editions, including decimals and percentages. Using a multitude of engaging problem solving activities, an area of maths that children often find difficult is made very accessible. Postage is included in the price of this item. Click here to also see the 'Circa Number Collection', another special compilation of back issue magazines. This collection of five CIRCA issues covers a comprehensive range of activities USING DATA, including puzzling out 'Gruesome Graphs' compiled from data of Ancient Rome, creating a fantasy Mayan 'Pok-a-Tok' team, and cracking codes with top secret agents. 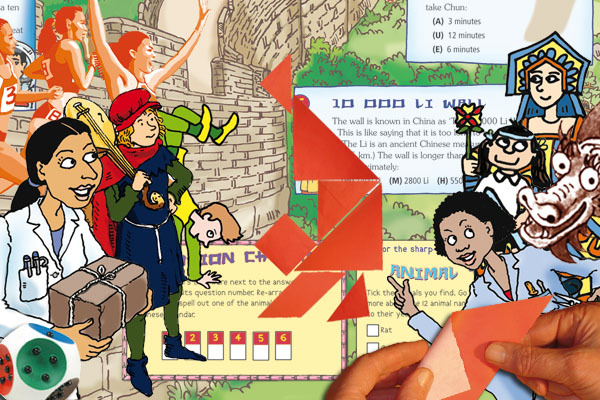 Full of exciting and engaging problem solving activities, this is a highly entertaining pack. Postage is included in the price of this item. This is a very useful compilation of five CIRCA issues which cover MEASURE, SHAPE and SPACE, including explaining longitude and compass points, triangles, co-ordinates, measuring distance, reading scales and volume. The range of engaging problem solving activities is comprehensive and great fun. Postage is included in the price of this item. As well as an excellent classroom introduction to real mathematics, these interactive mathematical investigations work particularly well on a single computer. Parents and children working together will share an exciting learning experience. Price includes VAT. 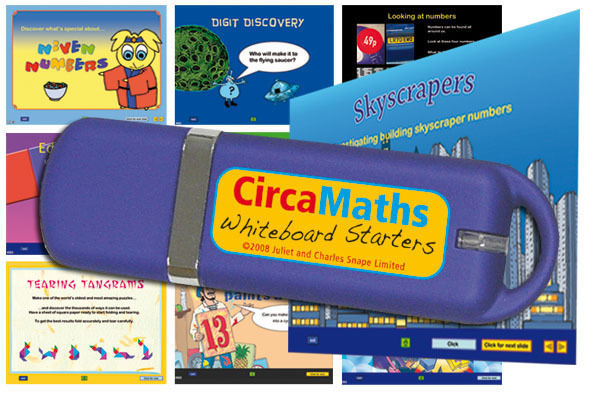 Click here for more about MATHS STARTERS. Children (or child and parents) are challenged to collaborate, discuss and reason whilst having bags of fun solving this beautifully illustrated suite of interactive activities. Written for Powerpoint*, they are cleverly animated and easy to use, so much more than any PP presentations you are likely to have viewed. On-screen explanations and prompts appear, allowing you to choose when to click for the next stage. 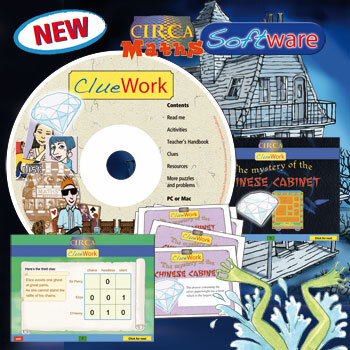 Clue sheets are designed to be printed off from the CD, as well as further puzzles and full printable support material. For pc or mac. The price includes VAT. To find out more about ClueWork click here. *Single user is suitable for home use or for use by an individual teacher. A site licence is for schools and allows it to be used by multiple teachers across a site. **free downloadable Powerpoint Player available online. 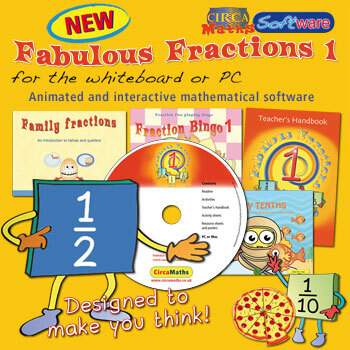 Fabulous Fractions 1 introduces children to fractions in a playful yet purposeful way. In the 7 activities they can learn about fractions of turns, halves, tenths and more. There is full support material on the disk including activity sheets and posters. Written for Powerpoint*, they are cleverly animated and easy to use, so much more than any PP presentations you are likely to have viewed. For pc or mac. The price includes VAT. To find out more about Fabulous Fractions 1 click here. Fabulous Fractions 2 contains 8 activities that tackle decimals, common fractions, percentages, comparing and using them, how to use a calculators for converting fractions, as well as a more advanced version of Circa's entertaining 'Fraction Bingo' game. 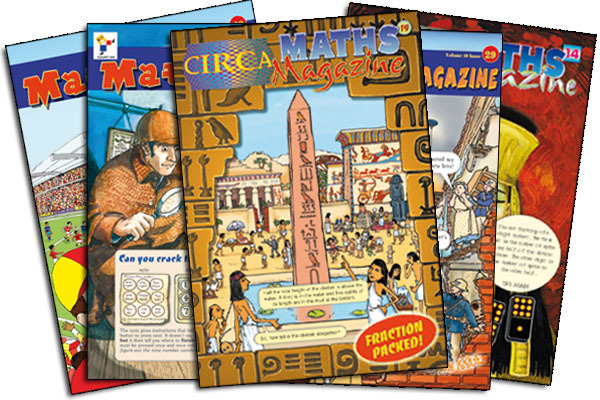 There's also a fascinating investigation into 'Slicing fractions' and a magical exploration of ancient Egyptian numbers and their use of unit fractions. There is full support material on the disk including activity sheets and posters. Written for Powerpoint*, they are cleverly animated and easy to use. This refreshing approach will help with understanding and make working with fractions exciting. For pc or mac. The price includes VAT. 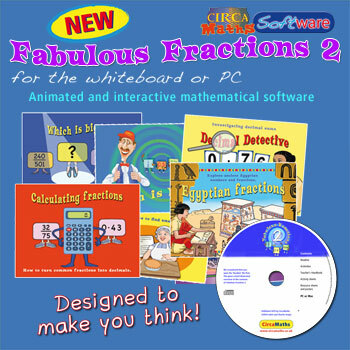 To find out more about Fabulous Fractions 2 click here.